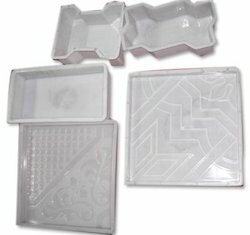 Our product range includes a wide range of plastic moulds. We manufacture high-grade Plastic Moulds in various shapes and sizes with distinct technical specifications for interlocking pavers. We can also provide complicated designs of Moulds as per the requirements of the clients. The Plastic Moulds, designed by us, are made up of superlative raw materials due to which they render consistent period of time. As the result, our Plastic Moulds are high on demand in national as well as international markets.